1. 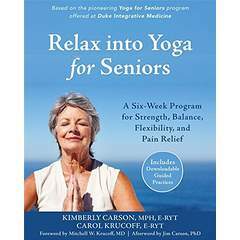 Complete the Integrative Yoga for Seniors foundational training with Kimberly Carson & Carol Krucoff. Individuals who did not attend the Master program at Duke Integrative Medicine, but completed an abridged program with Carol & Kimberly at Kripalu or elsewhere, will need to complete the following additional assignment: Interview someone who has gone through cardiac rehab or pulmonary rehab. Write a short (500 word) paper describing this person’s experience and how physical activity impacted their recovery. 2. Complete the Mentored Project as described below. Individuals who present at a Yoga for Seniors Professional Conference will be exempt from the Simple Study requirement of the mentored project. However, even those who present at the conference will still need to complete the other components of the mentored project (i.e., research information on a health issue relevant to seniors, create a community-based yoga class targeting the health issue, conduct the class, write a report as well as the executive summary abstract of your project). 3. Submit a video of you teaching a class to seniors. This video will be reviewed and evaluated by your project mentor. 4. Have a current CPR/AED certification. 5. Have a minimum of one-year of experience teaching yoga to seniors. 6. Successfully complete an open-book test. Upon satisfactory completion of the above requirements, you will be certified by Kimberly and Carol in Therapeutic Yoga for Seniors. A fee of $100 per hour will be charged for mentorship – with the anticipation that, in most cases, the certification process will require three hours of mentorship. Summary: Under the mentorship of program directors Kimberly Carson and Carol Krucoff, students will explore an aging-related issue of their own choosing, for example: Hearing Loss, Insomnia, Incontinence or Depression. The project will center around developing a yoga class that addresses the special needs of older adults with the selected health issue and preparing a report on their findings and experiences. Research: Gather information on the topic and create a summary document (500 words) that includes information on the health condition including a description, its prevalence, common symptoms and why yoga may be a helpful tool for this condition. Include a bibliography that contains at least four sources—with at least one of the sources a medical journal. Community-based Yoga Class: Develop and teach a yoga class that addresses the special needs of older adults with the selected health issue. Each class must have a minimum of two students and must meet for at least four sessions. Teachers who have experience teaching groups of seniors may design an individualized intervention to work one-on-one with at least two different students for at least two sessions each. *A case study where you follow one individual including your observation and report of their challenges, specifically noting what you observe in their abilities at the beginning of the yoga program and how these change over times with specific examples, such as “During the first week, she did not get up out of the chair.” Please also include observations of how they are interacting with other students, willingness to try different facets of the program, conversations they have with you. Collect information throughout the program and at the end that explores their experience with the program and how it affects the health condition (or its symptoms) being studied. Regular Contact (via email) with assigned mentor, at specified periods to give project updates. Written Report on the project—what you studied and what you learned. Please be sure to include: your name with contact information, topic of inquiry (what you studied), definition (please define the condition you studied), main considerations and symptoms (include physical and emotional issues), top recommendations (what did you learn from this experience and what advice do you have for other yoga teachers who might be teaching students with this condition), and suggested resources (organizations, books, web sites that you found useful). Project Abstract. This will be a one-page “executive summary” of your project which should include the following headings: your name with contact information, topic of inquiry (what you studied), definition (please define the condition you studied), main considerations and symptoms (include body physical and emotional issues), top recommendations (what did you learn from this experience and what advice do you have for other yoga teachers who might be teaching students with this condition), and suggested resources (organizations, books, web sites that you found useful). Identify your topic of inquiry and email your mentor with your suggested description of what you’d like to do. You might include, where are you going to do project and with whom (e.g., YMCA, church-based group senior center, assisted-living, hospital-based wellness center). Begin research effort, including field observation, collecting information on about your topic, and optional interview with health professional. Develop a simple evaluation for the students you will work with to look at the impact of yoga on the health issue you are planning to study (e.g. effect on mood — more relaxed, less tense). For example, this could be a questionnaire you ask students to complete before and after they have taken your yoga classes or it could be a test you will administer to students (such as the timed “get up and go” test) before and after the classes. Teach Your Program. You may want to keep notes about your observations (what worked and what didn’t work from your curriculum) before and after each class you teach, which could be useful information when you’re ready to write your report. In particular include the postures in your lesson plan, plus modifications you made to suit this population. Write your report. Be sure to include all required items: research, simple study, community based yoga class (including sample lessons plans and modifications you made to suit this population. Most important are your reflections on what you’ve learned from this experience and what recommendations you would have for other yoga teachers who would be working with students who have this condition. Be sure that you maintain appropriate confidentiality and in as much detail as possible, describe the teaching experience and what you learned, especially highlighting challenges and discoveries, problems and solutions, lingering questions and where you would go next for your inquiry. Write your Project Abstract. This will be a one-page “executive summary” of your project. Submit your report and Project Abstract to your mentor.